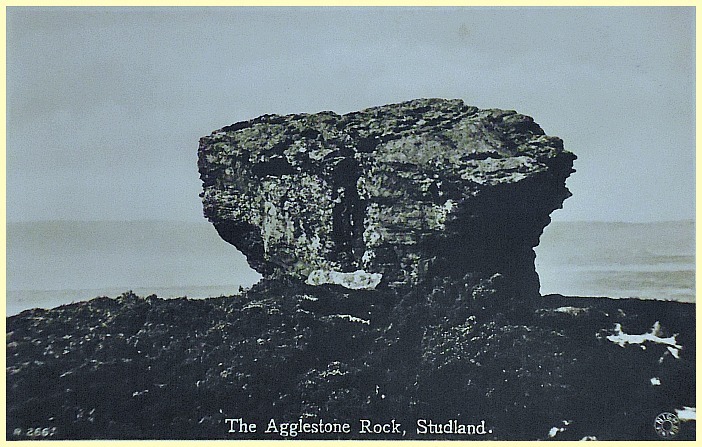 The Agglestone on Studland Heath, Dorset, early 1900s. Os grid reference: SZ 0236 8282. On Studland Heath 1 mile north-west of the village of Studland on the Isle of Purbeck, stands a strange rock formation called The Agglestone, which has now fallen on its side. Locally it has associations both in myth and legend with the devil who is said to have hurled the rock from the Needles on the Isle of Wight, to where it stands today but, as we all know and is often the case, he missed his target by many miles. But this strange rock formation has been gradually eroded away over many thousands of years by natural forces, ie the weather. The town of Swanage is 2 miles to the south, while Corfe Castle is 5 miles to the west, just off the B3351 Wareham road. 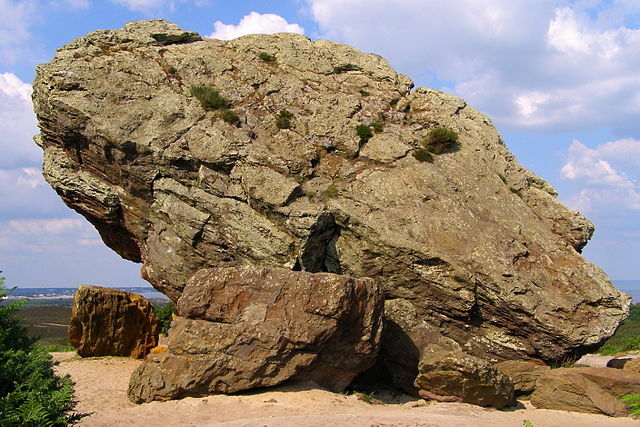 The strange-shaped Agglestone Rock is 20 feet high and is estimated to weigh 400 tonnes. It is perched upon a conical-shaped hill and is made of tertiary Sandstone, according to Wikipedia. Also known as the Devil’s Anvil, due to the shape we see today, or the Devil’s Nightcap. The name Agglestone could in fact be a derivation of Eagle Stone and, maybe locally ‘wobble stone’ because “aggle” is the local name for ‘wobble’ or ‘wobbly’, apparently! It is said, according to the myths and legends associated with the rock, that the Devil in anger decided to hurl it from the Needles on the Isle of Wight (where he just happened to be standing) to Corfe Castle to which he had taken a dislike, according to Janet & Colin Bord in their book ‘The Enchanted Land,’ or perhaps the city of Salisbury where the great cathedral stands, or was he aiming at Bindon Abbey near Wool in Dorset. It is also possible I would think, that the Devil intended the large rock to hit Christchurch, Dorchester, or maybe even Wimborne Abbey, in fact just about any Christian community in the south and south-west of England was in his reach, and quite a reach that would be! Bord, Janet & Colin., The Enchanted Land, Thorsons, Hammersmith, London W6, 1995. Categories: Rock Formations | Tags: The Agglestone on Studland Heath in Dorset | Permalink.